Auto Correct is a handy feature of iOS which immediately fixes your typing mistakes by replacing any incorrectly spelt words with ones that are correctly spelt. Due to the size of the iPad and iPhone keyboards, and the lack of tactile feedback, it’s a lot easier to make typing mistakes than on a physical keyboard. So Auto Correct is quite useful on these devices. But there’s a problem: Auto Correct doesn’t always get it right. Given an incorrectly spelt word, there are usually several possible candidates for replacement, and no software is intelligent enough to guess which one you meant in all cases. The word you typed may even be valid, but just absent from the system’s dictionary. What you often end up with is documents or text messages in which the words all have correct spelling, but not necessarily the correct meaning. In some cases this can lead to some very embarrassing results — many of which have been thoughtfully archived for public reference at one of my favourite websites, damnyouautocorrect.com. 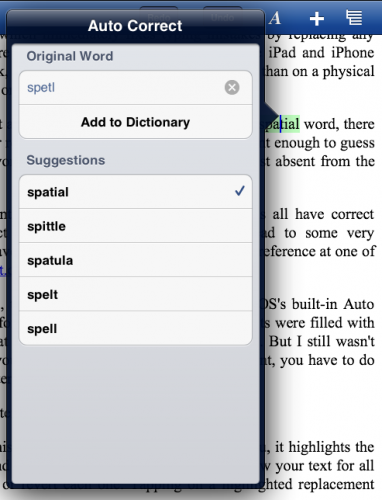 In the early testing I did with UX Write, the most annoying aspect by far was iOS’s built-in Auto Correct mechanism. I tried turning it off for a while, but I found that my documents were filled with lots of typing mistakes, so I decided that on balance, it was better to leave it on. But I still wasn’t happy with it. Even though it does give you the opportunity to cancel a replacement, you have to do so immediately, which I found a major interruption to my writing flow. So I’ve come up with a way to make it better. 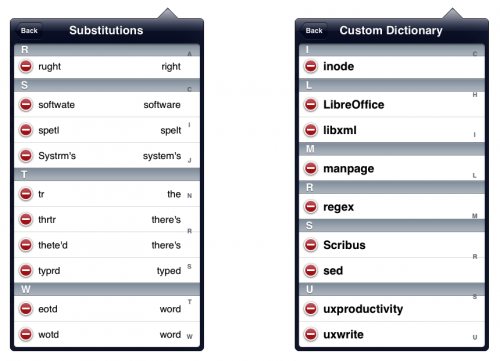 Both the custom dictionary and list of previously-accepted substitutions are accessible from the settings menu. If you accidentally add a word to the dictionary or accept a substitution that you didn’t mean to, you can easily go the appropriate list and remove it. The only limitation of this in the first release of UX Write is that it only works for US English. I’m planning on adding application-wide and document-specific language settings, so you can have the correction mechanism work in any language that iOS supports. Daniel Hooper’s text selection concept video posted a couple of months ago received a tremendous amount of positive feedback from many tech blogs and readers. 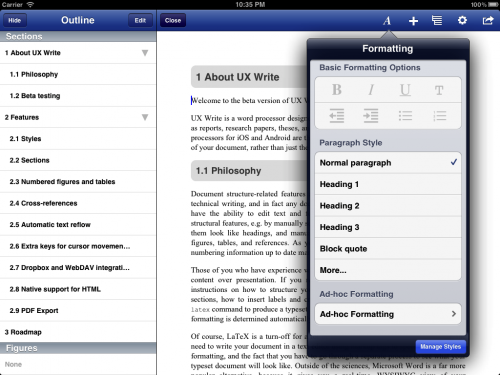 Like many others, I think it is a revolutionary idea for making text editing on the iPad a much more pleasant experience. Its main advantage, in my opinion, is that you can move around and select text without your hands needing to leave the keyboard. Another advantage is that when selecting text, you avoid the delay associated with the standard long-press gesture. I’m happy to announce that I now have this mechanism fully implemented in version 1.0 of UX Write. The app just been submitted to Apple for approval and will hopefully be available on the app store fairly soon. I’ve done some things differently to Daniel’s original prototype, partly because of some implementation problems I ran into earlier, and also some usability suggestions I’ve had from others who’ve seen it. Rather than using a gesture over the normal keyboard to move the cursor, you need to first hold down the “move cursor” key (at the far left of the top keyboard row). This switches to a custom input view representing a virtual trackpad, which you can drag your fingers around. Dragging with one finger moves the cursor slowly, and dragging with two fingers moves the cursor faster, and snaps to the closest word boundary. Next to the move key is the selection key, which works in a similar manner, but can be used to select text. You can toggle between movement and selection just by moving the finger that you used to press either key — this makes it easy to position the cursor at the start of a word and then subsequently select it. Also shown in the virtual trackpad view are left and right keys, which can be used for both movement and selection. I found some cases in which my own gestures would conflict with behaviour that was built in to the system keyboard. One of these is where you can hold down certain keys to bring up a list of variations on the character — like ÿ and ŷ for the y key. Another case was with two-finger gestures, which were sometimes conflicting with the split keyboard gesture in which you drag two fingers in opposite directions to split the keyboard into two parts. Also, some keyboard types, like Chinese, allow you to draw characters by hand, and this wouldn’t have worked at all with the drag-to-move gesture.By using my own custom input view instead of the standard keyboard, I was able to completely avoid these conflicts, as well as conflicts with other system keyboard behaviour that Apple may choose to introduce in the future. Someone suggested to me that performing drag gestures over the keyboard felt unnatural, since it’s not something you would ever do on a physical keyboard. Everyone is familiar with the concept of a trackpad, so displaying the this instead makes it much more obvious what you’re supposed to do with it. The fact that this is triggered by the move and select keys, which are clearly visible in the top row of the keyboard, also makes it much easier for users who might not otherwise be aware of the feature to discover it. Although Apple provides public APIs for implementing your own custom keyboard views and accessory views (the extra row of keys above the system keyboard), there is unfortunately no API support at present for replicating the appearance of standard system keys. To achieve a consistent look and feel, developers have to come up with their own custom mechanism for mimicking the appearance of the standard keys for their own additional keys. While this isn’t overly difficult, it would be good to see future versions of iOS expose an API for this purpose, since it’s something that a number of applications do. 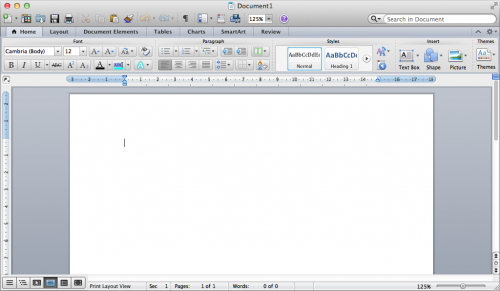 Styles, a feature of most desktop word processors, help you achieve consistent formatting throughout your document. For each paragraph, you simply indicate whether it is a heading, normal text, or some other type of content, and then you can separately change the formatting for all paragraphs with that style from the one place. 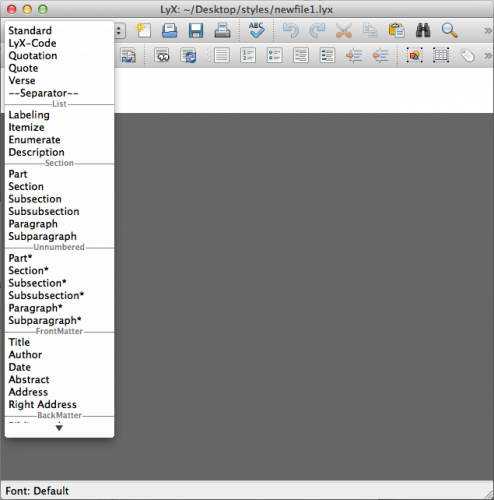 Styles also indicate certain structural information about the document — for example, a word processor that knows which text corresponds to a heading can provide automatic numbering, a table of contents, and an outline view. Despite the advantages of styles, many people don’t know how to use them, and end up wasting lots of time formatting their documents manually. Examples of this include selecting text and changing the font size to make it look like a heading, and directly entering in section numbers. This seems to work fine at first, until you have a 40 page document and decide you want to change all the headings to a different font size, or add another section near the start of your document. I once saw a PhD thesis whose author, who shall remain nameless, had constructed their table of contents manually. For those of us who know how to use styles, or other structured authoring tools such as LaTeX, it can be tempting to simply blame the user for not spending time learning how to use their word processor. But I think the real fault lies in the user interface design of most word processors, which emphasise direct formatting over styles. As a result, many users do not even know that styles exist. I’m going to talk about Microsoft Word here, since it’s the most popular, but others based on similar designs — such as OpenOffice and Google Docs — deserve an equal share of the blame. Can you spot the problem here? The majority of the toolbar is devoted to direct formatting, and styles are presented as if they are a secondary option, rather than the default way of doing things. Many of the buttons on the left side of the toolbar are things that in a structured authoring process you would rarely, if ever, use. Styles are given only a small portion of the space, which sends the message that changing formatting details such as font, size, line spacing, and paragraph alignment is best done on a case-by-case basis. You can’t see it in the screenshot, but there’s a button which lets you select from a more complete list of styles; it’s just invisible until you move your mouse over the area where the button is. If you resize the window to make it narrower, this area is collapsed to a single “Styles” button which, when clicked, brings up the list. This in itself is not a problem — the issue is that the direct formatting options are made a great deal more prominent than the style options, which means most people will naturally gravitate towards the former. 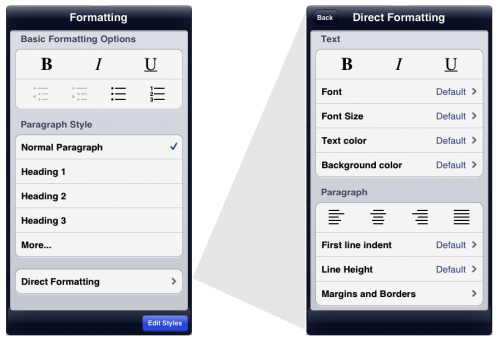 The “Basic Formatting Options” and “Paragraph Style” sections of the formatting menu are intended to suffice for 98% of cases. The “More…” item expands the list with additional built-in styles, and also allows you to add your own custom styles. The “Edit Styles” button at the bottom of the popover brings up a full-screen style management interface, in which you can edit both built-in and custom styles. For the 2% of cases where you do actually have a need to set the formatting uniquely for one specific piece of text, you can do so using the direct formatting menu. I’m hopeful that this will result in users finding it much easier to not only discover the concept of styles, but also make use of them. I think Word and its clones have their priorities the wrong way round in terms of formatting, and teach users bad habits which ultimately make it more difficult to work with large documents. The main downside to my approach is that it may initially be a turn-off for people who have become used to applying direct formatting everywhere — but hopefully this interface is clear enough to make it obvious that styles are the way to go. I’m interested in feedback on this design – what do you think about it? He’s certainly right that text editing could be made a lot more efficient. Accurate cursor positioning, in particular, is quite difficult with the default iOS mechanism. I already have cursor movement keys in my app like those in IA Writer, but this approach looks even better. Single-finger cursor movement is fine. You can swipe on the keyboard in any direction to move the cursor, and it moves at one-third of the speed you move your finger, for very precise positioning. Cursor movement only begins once you’ve moved your finger a certain distance away from the original key, so you won’t see it occurring accidentally while you’re simply typing. Two-finger movement is problematic because it conflicts with the built-in iOS split keyboard gesture. I have it working most of the time, but in certain cases the touch events will be interpreted as an attempt by the user to split the keyboard. As in the video, using two fingers allows you to move the cursor faster. Selecting text by holding down shift while you drag with another finger also works most of the time, but in some cases results in extra characters being inserted. With shift pressed, dragging from one key to another causes iOS to highlight the other key and display a list of alternative characters; this doesn’t happen when shift is not pressed. It’s these keys that are causing problems for me at the moment. My implementation works by intercepting touch events in UIApplication’s sendEvent method, and detecting those which are within the keyboard window. It’s possible to filter out events before passing them on to the application, which might be a solution to the problem. While I’ve still got some more work to do on two-finger movement and selection, I’m really happy with the cursor movement and think it’s going to make editing a much nicer experience. Daniel has suggested that users petition Apple to include this functionality in iOS itself, but why wait for that? As app developers, we can start implementing this right now. The jailbreak community has in fact just done this, and plans to have it available tomorrow. I’m going to come back to this in a few days once I’ve finished up table editing and made some more tweaks to the style editor which I want to have in for the next beta, but will post an update with more details once I’ve gotten this all working properly. One of the least exciting but nonetheless necessary tasks involved with writing a content creation app for iOS is implementing a way to get data in and out of the app. While adding iTunes file sharing support is trivially easy, it’s pretty much expected that your app will also support online file storage services like Dropbox and WebDAV, which involves a lot more work. Most productivity apps on the iPad support this, so I had a look at number of them to see how they do it. Store all the documents locally, and provide import and export options for transferring individual documents between the iPad and the server. I don’t like this approach, because it means that if you’re regularly going back and forth between your computer and your iPad, you have to manually do the import/export each time, which is a pain. Use iCloud. This is fine if you only ever want to access documents from the same app you created them in, the app is available for both your iPad/iPhone and your Mac, and the app supports iCloud on both platforms. But there’s no generic way of getting at your files from a PC or Mac, which I think makes it pretty useless. iWork documents are an exception, but even then you can only access them through a web interface, which doesn’t provide automatic synchronisation. Allow access to files directly from the server, downloading them as necessary, and uploading them when they are saved. 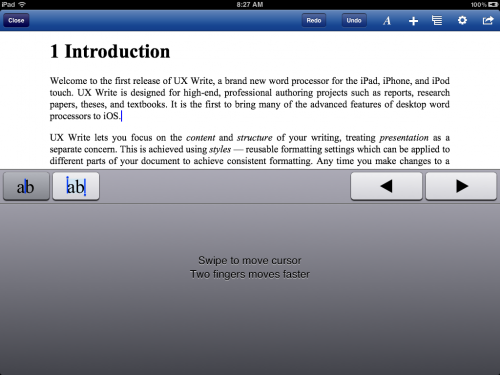 After closing a document, no local copy is kept on the iPad. It has to be re-downloaded each time you open it, even if it hasn’t changed on the server. Worse, you can’t access it offline – if you want to make some edits to your document on the train to work, you’re out of luck. When saving a file, you are forced to wait for the upload to complete before you can carry on with your work. UX Write keeps a local copy of any file you’ve previously opened. At regular intervals, or when you press “refresh”, it checks to see if these files have changed on the server and downloads any updated versions – in the background. You can also tell it to maintain a complete local copy of specific folders from your account. If you try to open a file and there’s already a local copy of the latest version, it will open immediately. When you save a file, it is written to local storage immediately, and uploaded in the background, while you continue with your work. If you’re not connected to the Internet at the time, it will upload the file later on, as soon as it gets a chance. If the file has been modified independently on both the server and your iPad, you’ll be notified and given a chance to save your copy under a different name so you can later reconcile the differences. 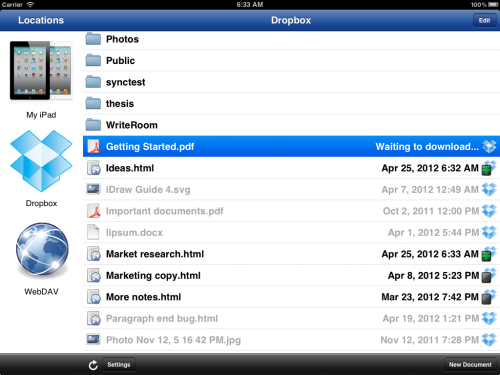 The screenshot above shows what the file management interface looks like. Files that have a copy stored locally are shown in black, and files that exist on the server but not on the iPad are shown in grey. The icon to the right of each file shows its synchronisation status; the green ‘+’ over the iPad in some of these icons indicates that the file has been modified locally and is scheduled to be uploaded as soon as any other transfers have completed. I’ve implemented these features in a generic manner which is not specific to any particular storage service, so it’s fairly easy for me to add support for new services. The first release of UX Write will support Dropbox and WebDAV, with other services being included in the future. So I’ve decided to start writing publicly about the project I’ve been working on for the past few months: a brand new word processor for the iPad. At first glance this may seem a bit redundant — there are already many of these in existence, so why does the world need another? Well, UX Write differs from other tablet word processors in some fundamental and important ways. In particular, it is designed specifically for professional writers who work with structured documents, in which content and presentation are separate concerns. What this means for you as an author is that while writing your document, you can focus solely on what your writing says, while later on, either you or someone else decides what it looks like. During the writing process, you enter text, organize it into sections, add figures and tables, and label any paragraphs that have special meaning, such as “Exercise” or “Example”. Separately, you choose an existing template or define your own styles which specify formatting attributes such as fonts, colours, paragraph alignment, margins, indentation, and line spacing. You can thus achieve consistent formatting throughout your whole document without having to manually format paragraphs on a case-by-case basis. Of course, desktop word processors such as Microsoft Word and OpenOffice have worked like this for many years, but for some reason, developers of similar apps for tablets have chosen to omit these features. I looked at all of the word processors available for both iOS and Android tablets and couldn’t find a single one which works as I’ve described above. As an academic, I was looking for something I could use for writing things like research papers, lecture notes, and books. Ideally, I wanted something like LyX (a graphical frontend to LaTeX), which I’ve used for many years, including for writing my entire PhD thesis. I love the tablet form factor, and think that hardware-wise, they are excellent tools for getting work done on the go. But the software is currently lacking — we need more professional-quality content creation tools that provide the same level of functionality as their desktop counterparts. One particularly good example is the iPad version of OmniGraffle — which, as far as I can tell, includes every single feature that is present in the desktop version. UX Write is designed to meet the needs of professional writers such as academics, graduate students, technical writers, any anyone else writing large documents such as manuals and reports. The app is not yet complete, and I’ve just recently got the first version out to a small number of beta testers. But I need more — if you write in a professional capacity, and want to be a part of bringing structured authoring tools to the iPad, I’d love to have you try out the program and give me your feedback! Drop me a line at peter@uxproductivity.com.